Apple cofounder Steve Wozniak has thrown his support behind China's top smartphone maker, Xiaomi, and said the company's products could succeed internationally. "Xiaomi has excellent products; they're good enough to crack the American market," Wozniak told a group of reporters Sunday at the company's offices in Beijing. Xiaomi, which has become one of the hottest tech companies in China, invited Wozniak to visit and meet with its engineers. Wozniak said he had only just started using a Xiaomi smartphone but that he was impressed by the company and its products. Xiaomi is best known for its Android smartphones but it also sells smart TVs and is developing a Wi-Fi router. In the future it aims to create "smart" household devices that are controlled via smartphone. "This company has a good, strong vision," Wozniak said. "The products the company has built so far are very key elements to that future." 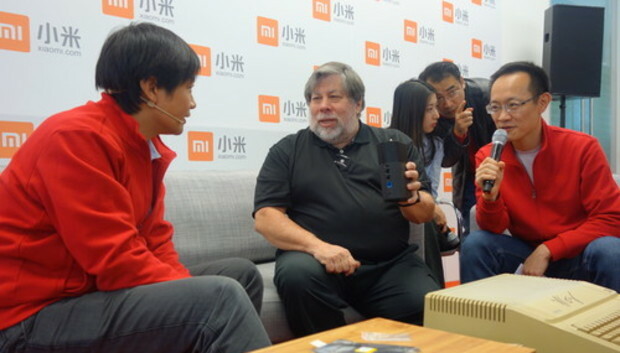 Wozniak often does speaking engagements and was apparently paid for his visit to Xiaomi. A few days ago he appeared at the company's New Year's celebration in Beijing. But it's also not the first time he has praised products from Apple rivals. In the past he has said that Samsung makes great products, and that he wished the iPhone could do some of the things Android could do. Buzz has been building internationally for Xiaomi even though it began selling smartphones less than three years ago, and only in China and Taiwan. Xiaomi handsets have quickly become some of the most popular in its home market, with its shipments in China at times surpassing those of the iPhone. One reason for the company's success is that's its phones use high-end components but are sold at relatively low prices, with its flagship handset starting at 1999 yuan (US$328) without carrier subsidies. It's unclear how much profit Xiaomi makes from each phone, if any, but it's following a similar strategy to Amazon with its Kindle, selling software and virtual products over the device to offset the cost of the hardware. Xiaomi's ascent has earned it comparison's with Apple, and it generated further buzz last year when it hired former Google executive Hugo Barra to lead its international expansion. Xiaomi cofounder and CEO Lei Jun has tried to downplay the comparison to Apple, but on Sunday he said he admired Wozniak and his work creating the first Apple products. "We invited Wozniak to Xiaomi to inspire our engineers to build competitive products that are almost like art," he said. "This is the approach we've taken with our most recent products." Later this year, Xiaomi will expand beyond China and Taiwan and begin selling phones in Singapore and Malaysia, two markets with large Chinese speaking populations. Wozniak said he was unfamiliar with the tech company landscape in China but said he had the "strongest hopes" for Xiaomi. Any handset company entering the U.S. will face challenges, but creating affordable products with strong features is the right direction to go, he said.